In 1492, Notaries Sailed the Ocean Blue. Notaries accompanied Columbus on all his voyages just as they accompanied nearly all early Spanish explorers. The reason: King Ferdinand and Queen Isabella wanted to ensure that all discovered treasures were accounted for. 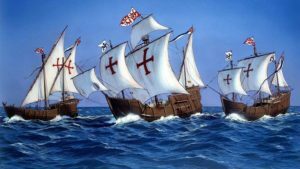 On October 12, 1492, when Columbus first beheld the New World, a Notary named Rodrigo de Escobedo was on hand to document the landing on San Salvador Island in the Bahamas.